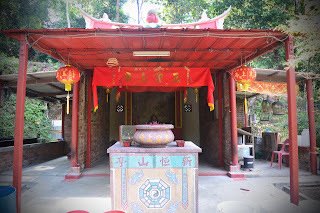 Sin Heng San Teng Temple or Lao Sua Temple. 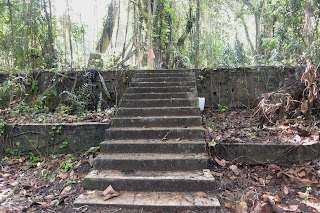 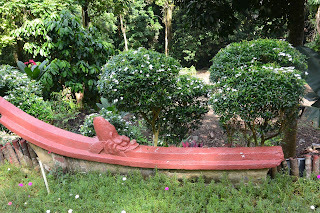 I had heard rumblings about this temple for awhile, hidden in the jungle of the Bukit Brown Cemetery and from reading and wandering I had deduced where I thought it was. 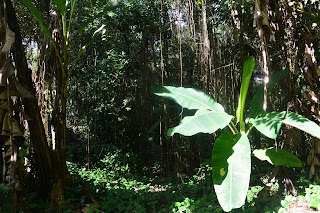 Indeed walking part way to it before returning to 20 expat ladies I had left standing on the roadside as I took a peak! 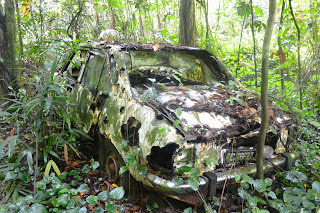 After speaking to a couple of the 'Brownies' I knew my suspicions were correct, I just had to find the time to get back there. Hence it remained on my 'bucket list' for months. 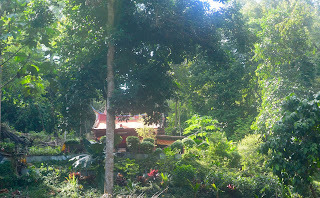 However recently the 'Brownies' themselves led a weekend tour to the temple, which my good friend attended. 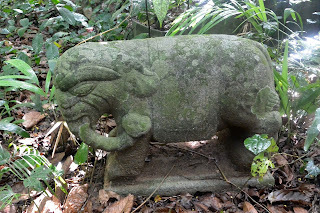 This gave me the kick to visit the following week. 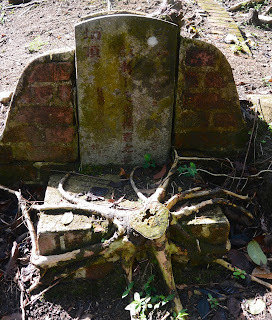 The cemetery surrounding the temple, before being incorporated into the great Bukit Brown cemetery, was once owned by the Hokkien Huay Kuan and known as the Sin Heng San Teng cemetery, hence the temple being called Sin Heng San Temple. 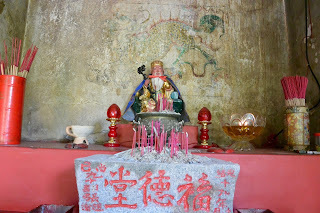 According to paper clippings on the wall of the temple, the incense burner dates back to 1893 and the original temple was located in fact in Bukit Merah from 1828 until it was destroyed by fire in 1992. 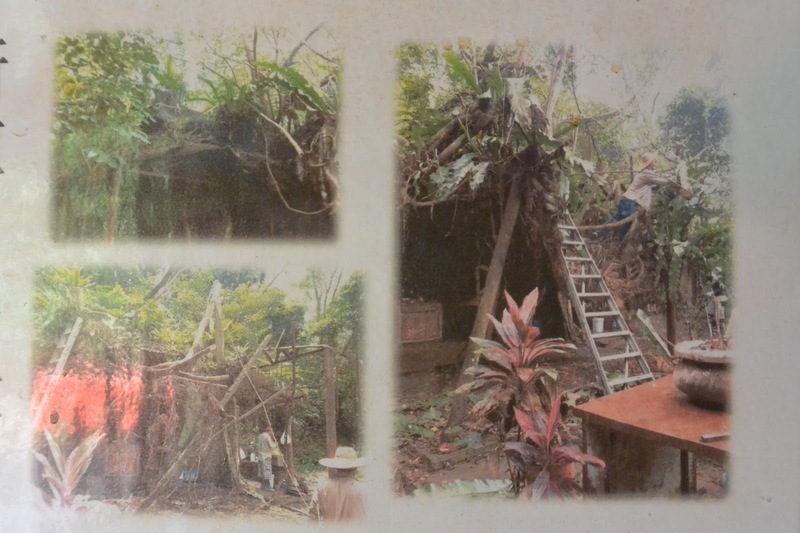 By 2012 Lao Sau meaning Old Hill had been completely taken over by the vegetation, the roof had collapsed and nature was in control. 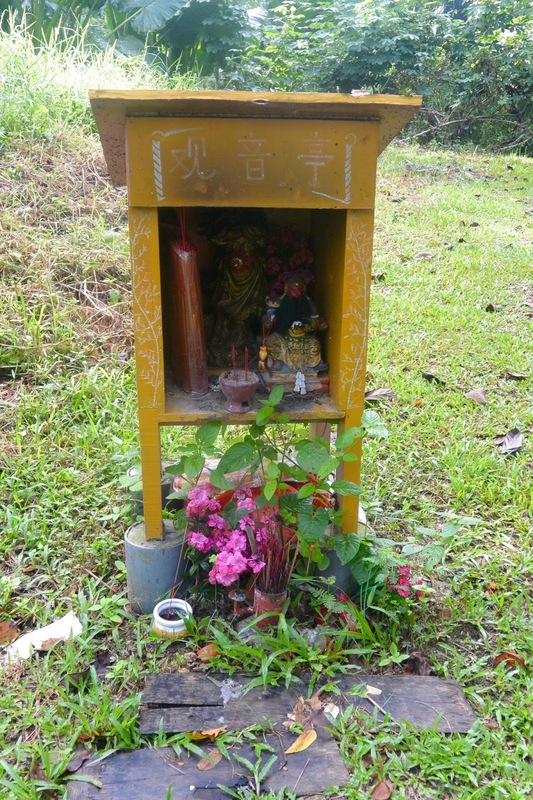 Sitting close by an old Kampong, adjacent to the PIE (Pan Island Expressway) the temple had been neglected and forgotten for many years. However thanks to a few diligent local residents of the old kampong (which was still in existence until the early 1980s) it has been reclaimed and renovated over the last few years to what we see today, sitting on a small hill in what is now a small clearing surrounded by the graves of Bukit Brown. 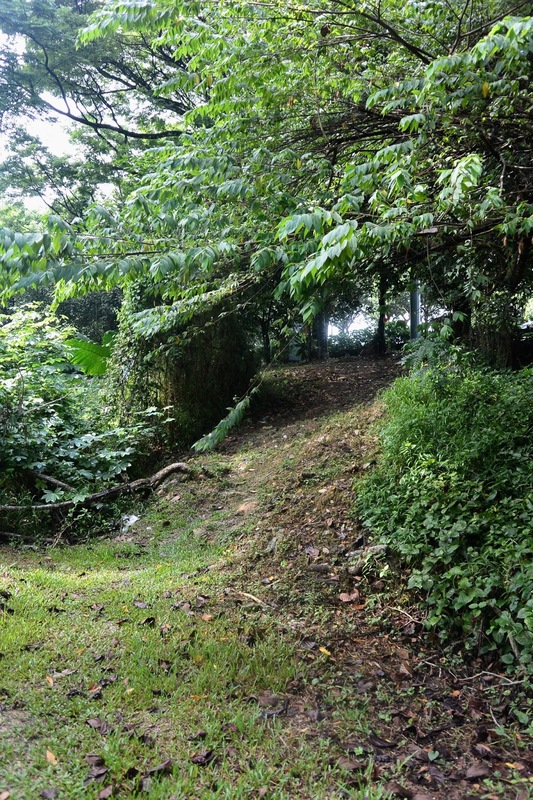 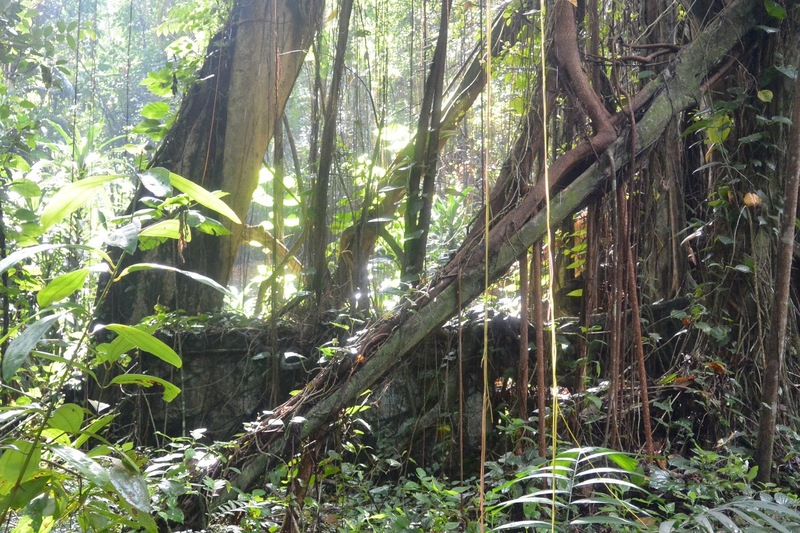 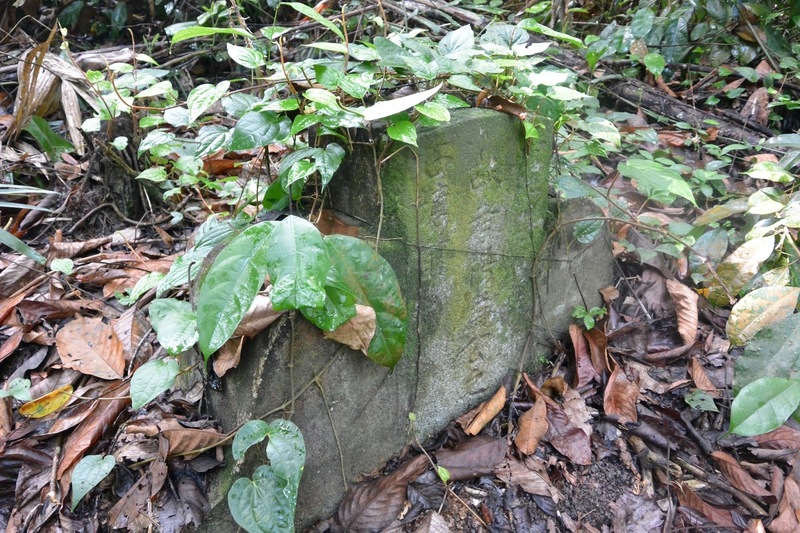 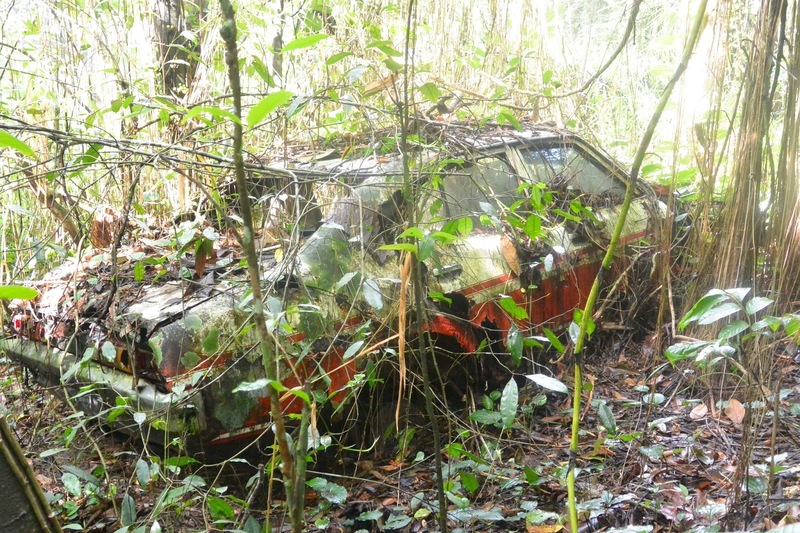 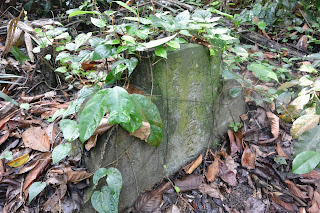 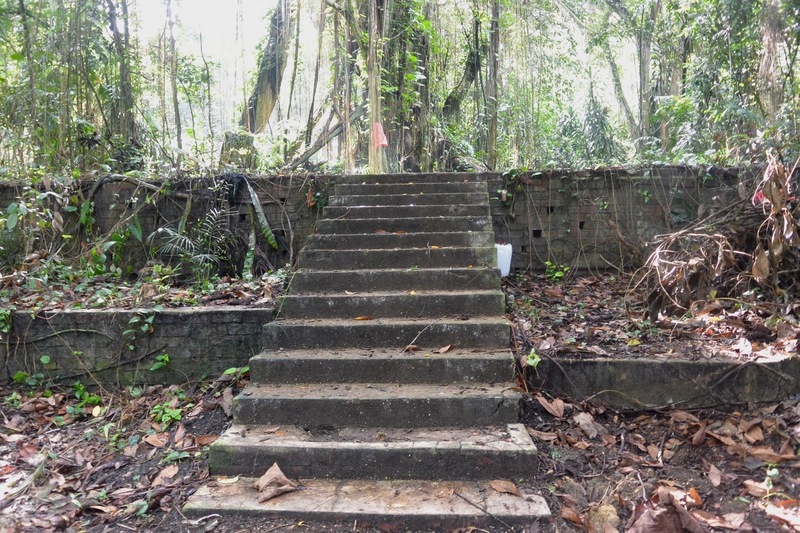 Look carefully as you walk through as the undergrowth is fighting the efforts of the few and you will spot the remains of the old kampong. 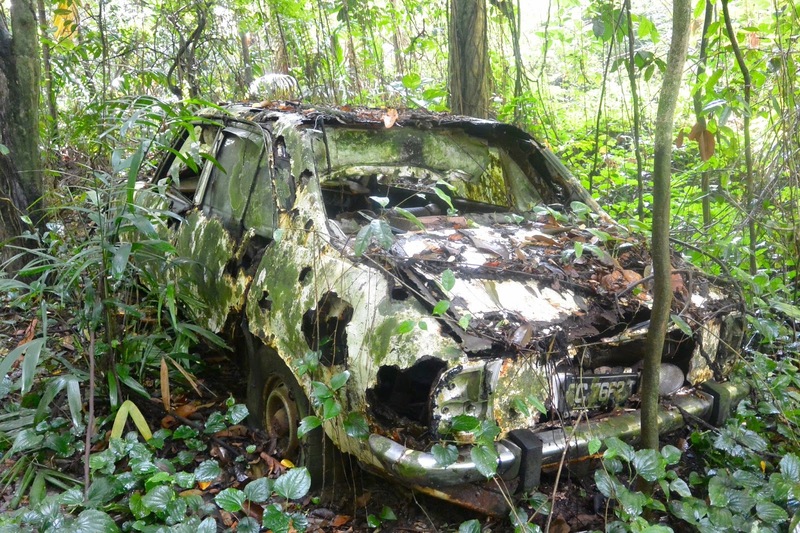 Rusting cars eaten away by the weather and humidity of Singapore, to steps leading up to the remaining foundations and lower walls, ghosts of the kampong buildings. 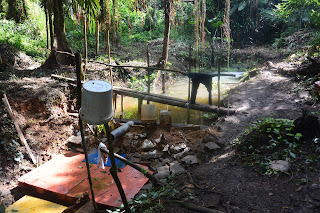 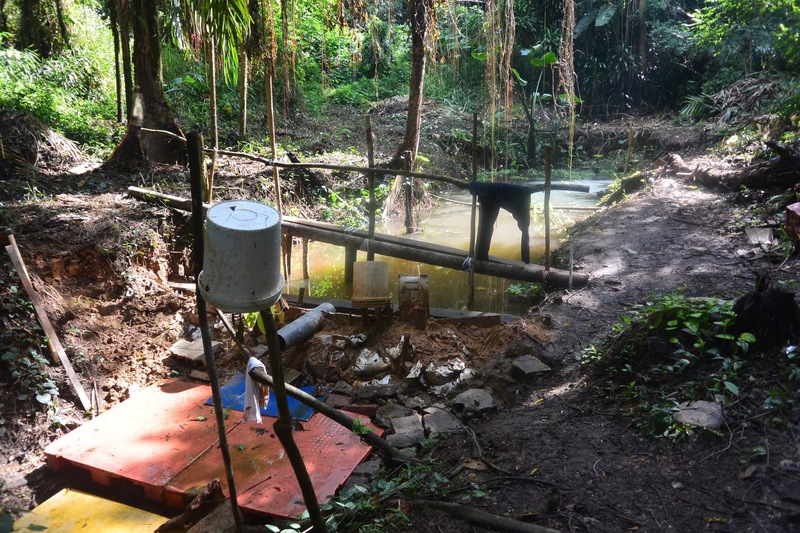 The men have rebuilt and dug out and dammed the old stream. You can now see small fish swimming in the pond, with damsel and dragon flies (and of course the ever present mosquitoes) hovering over its surface. 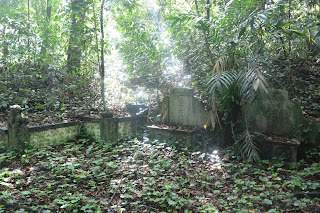 Sunlight shoots shafts of light through the thick vegetation, giving a beautiful, peaceful, romantic hue to the area, even though you are surrounded by the decay of the old kampong and watched by the spirits of those buried close by. The temple deity is Tua Pek Kong (Grand Uncle, the god of fortune) Much of the temple has been rebuilt using many of its original parts. 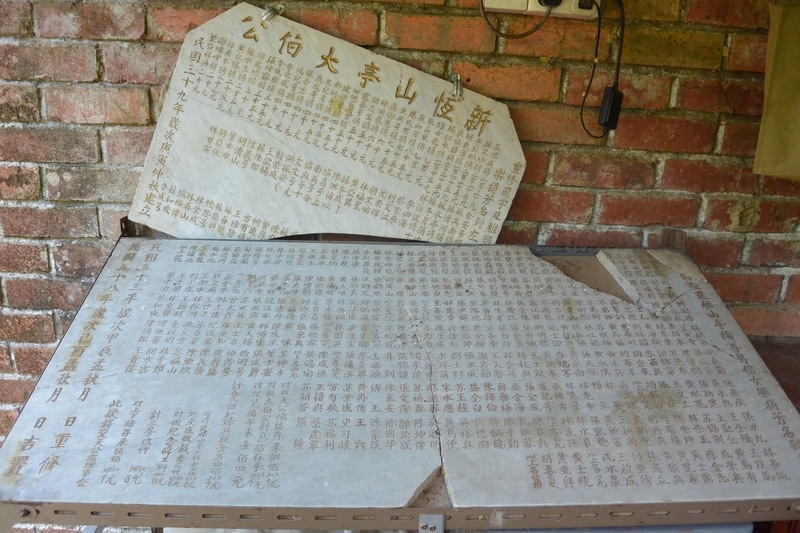 Plaques dating back to the 1950s can been found against the outside walls, which apparently tell of the temple being rebuilt in 1950 and 1969. 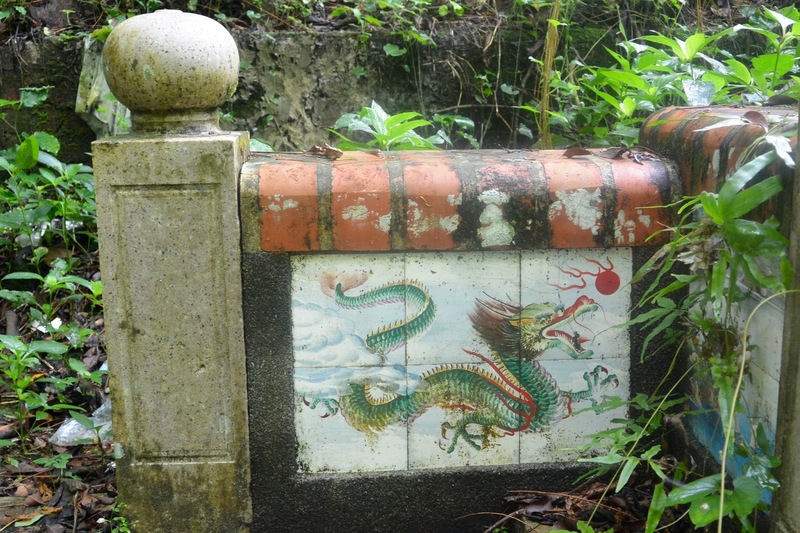 I love the feint remains of the dragon painting still showing on the back wall of the temple with Tua Pek Kong sitting just in front. You can spot in the "front garden" of the temple, the old remains of the roof decorations. Whisps of smoke rise from the burning of both incense and of rubbish! 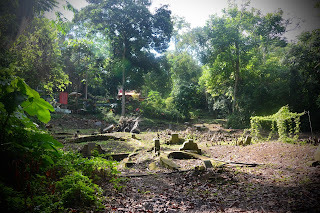 Indeed one of the cleared graves in front of the temple is clearly used as a rubbish burning pit. I am assuming the previous tenant has previously been exhumed! 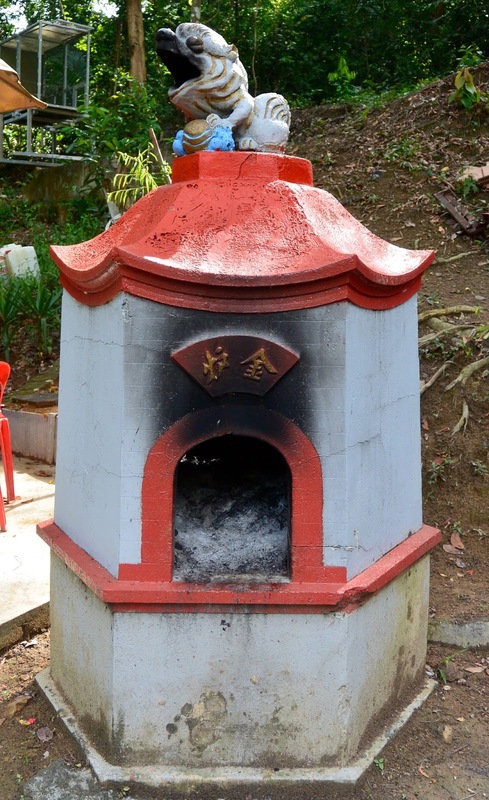 To the left of the temple (next to a true drop toilet) is the original joss paper burner, where you will spy smoke coming from the lions mouth at its top. 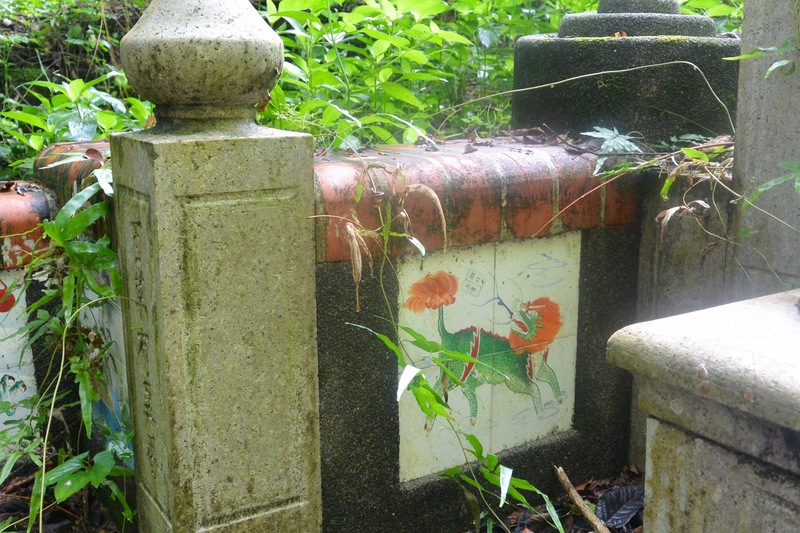 The whole area, of course as it sits within the cemetery, is surrounded by the graves of Chinese past. 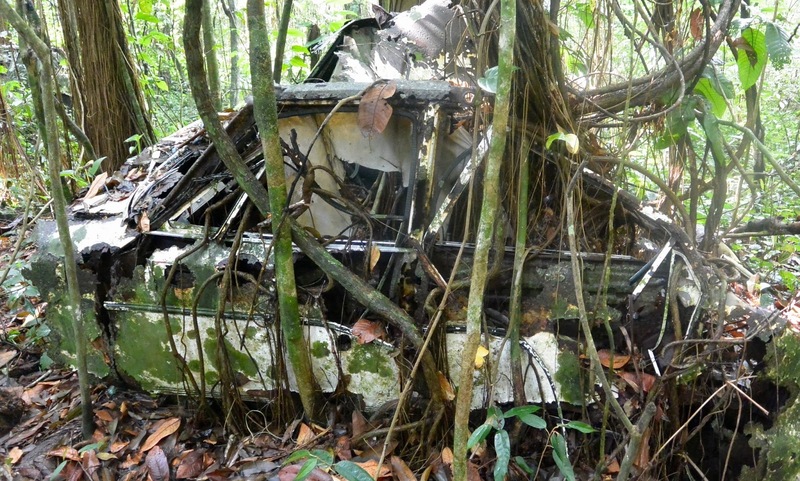 It is good to see many have been reclaimed from the wilderness, although as mentioned its a never ending job to keep everywhere cleared. 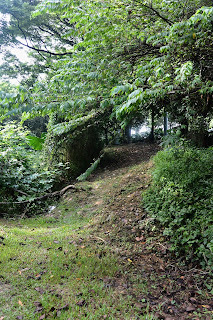 Indeed many of the small pathways were becoming difficult to spot when we returned just a few days after the 'Brownies' tour. 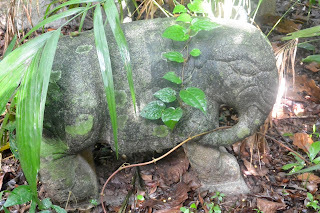 A couple of graves with a note is one that is flanked not by The Golden Boy and Jade Girl, or the Chinese Foo dogs and Lions of the Chinese guardian dogs that are so often seen, but this particular grave is guarded by 2 elephants. 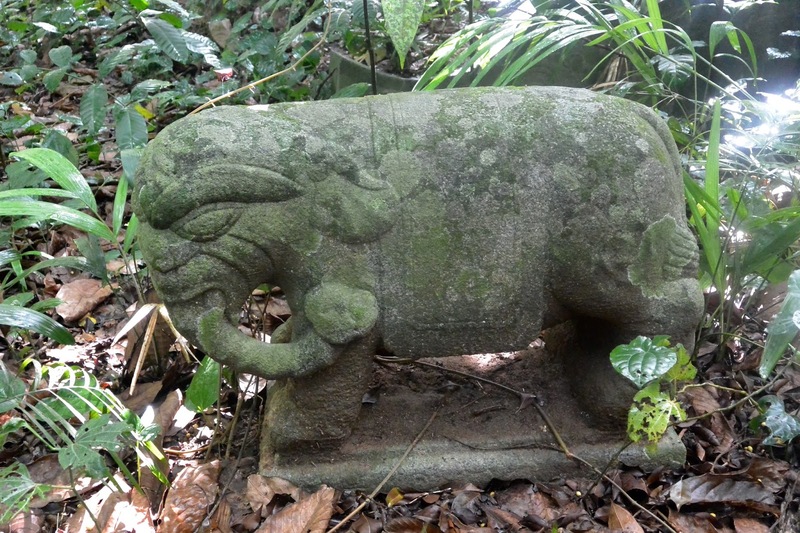 A I mentioned in my Japanese cemetery post http://www.singaporetales.co.uk/2015/06/japanese-cemetery-park.html to have such elephants in an Asian cemetery is very unusual. 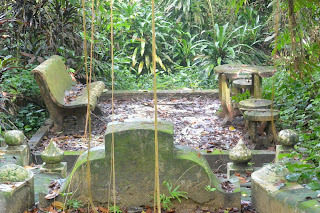 Close by this grave sits an extremely large and grand grave, clearly of someone of importance as sitting in front of the grave is a large paved area with table and chairs for the incumbents to relax upon in their after life. 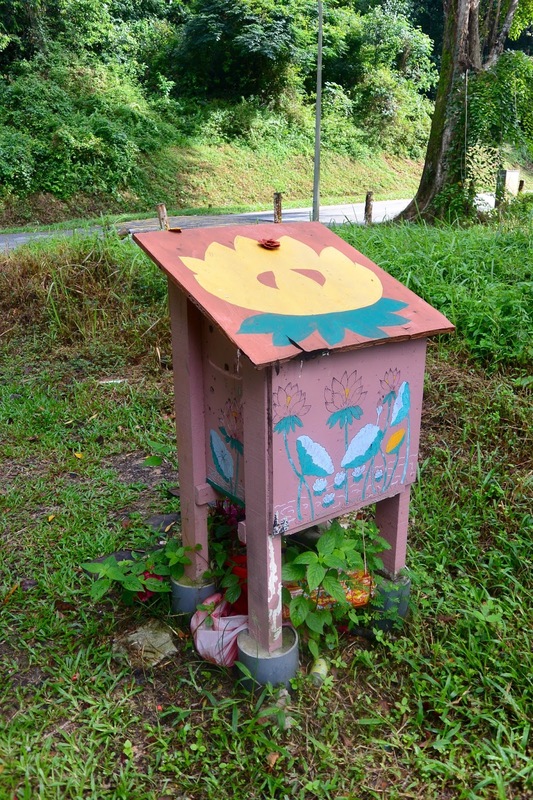 Although there is no escaping the persistent hum of the nearby traffic speeding along the closely expressway there is a serene peacefulness about this tiny idyll. Long may it remain and be loved and used. Well done to those whose efforts were involved in rebuilding Lao Sua Temple.